RevolverCig is running a deal on their own branded low resistance atomizers. These run on any 510 device and after looking at reviews – they seem to be all positive. For $2.99 its a steal and worth a try! So when it comes to rebuildables I can be a little lazy. Its so much easier for me to pop a $3.99 atomizer or $1.00 cartomizer on my PV. 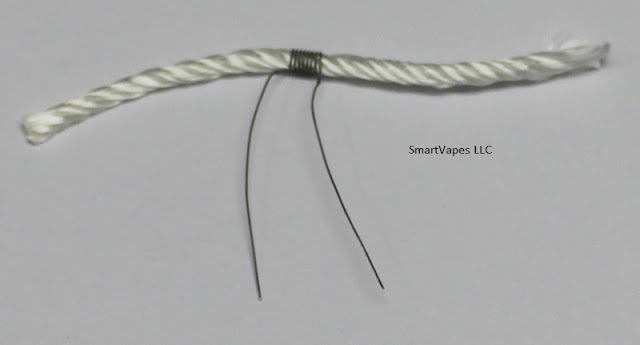 Smartvapes now sells premade wick and wire – made to exacting standards. These use 3mm wicking and High Quality Nichrome. These will fit most any rebuildables that use this style of wick and wire. These sell in a number of different resistances. Here is a great deal on a dual bay battery charger. It comes with a car adapter so you can charge your mod batteries on the go. HG-1210W Battery Charger. This is a very nice corded charger that also comes with car adapter. Has a switch that allows charging of LiFePO4 batteries as well as Ni-MH/Ni-CD and Li-ion batteries. The 4.2 volt position is used for Ni-MH, Ni-CD or Li-ion charging while the 3.6 volt position is used for LiFePO4 charging. Only 1 type of battery can be charged at a time. 750 ma output at 1.2 volts and 650 ma output at 4.2 volts, charges batteries fast. Smart electronics chooses the fastest charging method based on the inserted batteries. Easily fits 18650, 18500, 18350, 14500, 17670, 10440, 16340 and CR123. Plugs directly into a wall outlet and a single LED provides charge status for both channels. A/C and car cords are both 2 feet long. Easy to use and operate. Color of charger may vary and is not guaranteed. Picture with different colors shown. Chinese packaging with translated instruction sheet. 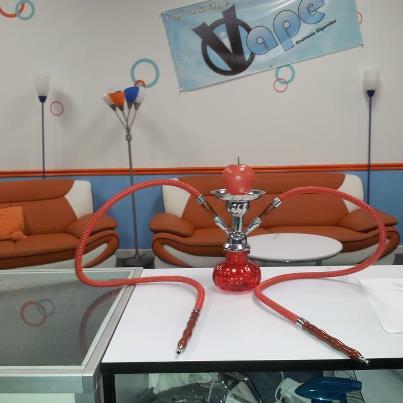 Extra coil and wick – the resistance of included coil is 1.8-2.0 ohm. Beautiful presentation cushioned tin with hinged flip top. Again smartvapes shows everyone what a deal is all about. T3 heads have been expensive and are starting to come down in price. These are authentic Kanger replacement heads for $2.13 – its a screaming deal. 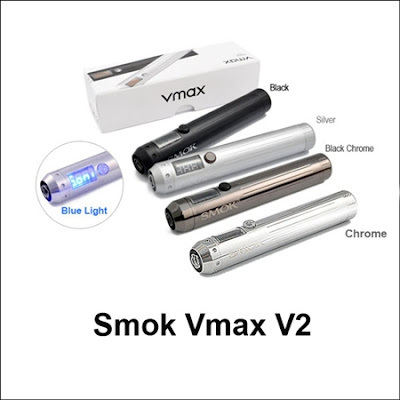 Here is a great deal on the Variable voltage Vmax by Smoktech. This is my go to PV most of the day and is by far one of the best Variable Voltage mods. These are the latest version Version 2, Revision 4. The product page says OUT OF STOCK but these are not shipping for another week. What more do I need to say? ‘T3’s for 3.95 – its a great deal! Buy them up while they last. This is the cheapest by far. VaporPheonix is running a great deal on Boge Cartomizers. They have all styles from XL or regular size. Load up and save! 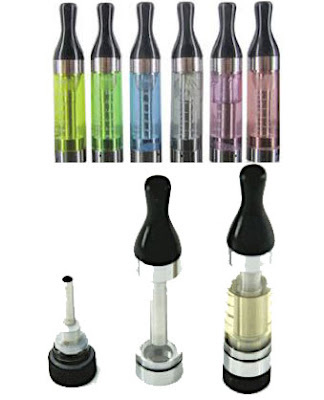 Boge Cartomizer 5 Pack Mix-and-Match Deal! You get 5 boxes of 5 cartos each for a total of 25! Choose from Black/Stainless Steel Standard or Low Resistance or XL. Personally, these are my cartomizers of choice. They create giant clouds of flavorful vapor, plus great throat hit. They truly are perfect for your Egos or any other 510 system. Available in standard and low resistance, they really add a punch to your ecig experience. Each cartomizer holds approximately 1ml of your favorite vape juice and the XL’s hold 1.5-1.6 ml of ejuice. Add a drip tip for that perfect look and feel. Stock up on these puppies, I promise you won’t regret it!! Compatible with all 510/ego systems. This is a steal. This has all the specs of the Zmax v2 in a tiny form factor. NEW ORDERS WILL SHIP JANUARY 8/9, 2013! 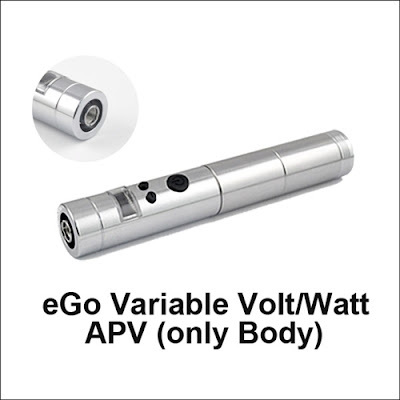 The eGo APV (Advanced Personal Vaporizer) offers high-end performance and features at a budget friendly price. The APV features a chrome finish a metal activation button. A blue OLED display and two adjustment buttons provide access to adjust this device’s many features. Power Options: This e-cigarette lets you completely customize your vaping experience. There are two modes of operation to help you set power output to the perfect level for your favorite cartomizers or atomizers. Variable voltage – adjust the voltage output of the eGo APV from 3.0 to 6.0 volts in .1 volt increments. Variable wattage – set the preferred wattage (from 3 to 15 watts) and the APV will adjust the voltage automatically no matter what atomizer you use. Battery Choices: Power adjustment isn’t the only customizable feature of the eGo APV. You may also choose from several battery configurations. The APV can use a single 18650, or two 18350 IMR batteries. If you want a smaller option, remove the center section and use a single 18350 battery for an ultra-compact advanced personal vaporizer. Compatibility. The APV features a 510/eGo connection. Unlike other APVs on the market, this version has the eGo cone threads in addition to the 510 battery connector threads. Note: the APV is sold as the device only. Batteries and accessories are not included. This unit carries a 30 day warranty. This is a feature included for advanced users. The APV allows the user to switch between methods the device uses internally to calculate the voltage output. The default and recommended setting is RMS. RMS provides a more accurate voltage output. The APV may also run in Average (or Mean) mode. Average mode may result in output voltages higher than the user selected voltage on the device. To switch modes, hold either the power up or power down button for 10 seconds. The display screen will display N01 for AVG mode or N02 for RMS mode. To change the mode, release the adjustment button then press and hold for an additional 10 seconds to change to the alternate mode. 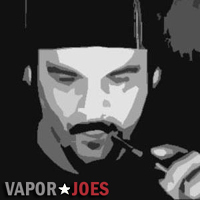 VaporJoes has started a deals and steals community on Google+. Much like our Facebook group – we are branching out once again to bring you the best deals the vaping community has to offer. We will also be bringing you news and new product information. Vendors and members are free to post whatever news and deals they may have. 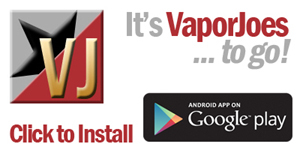 When you join please invite your vaping friends. Check it out.. Join… Save! CLICK TO JOIN THE COMMUNITY TODAY! The Zeus RBA – $10.00 Shipped. Vaporbeast is running a deal on the Zeus Rebuildable Atomizer. These are much like the classic Phoenix but a little bigger. Considering everything at Vaporbeast ships free – its a great overall price. The ZEUS rebuildable dripping atomizer is for experienced vapors. This product requires technical aptitude and the ability to re-wind the coil back around the replacement wick. * 1 510 threaded ZEUS rebuildable atomizer. * Designed to be disassembled and put back together. 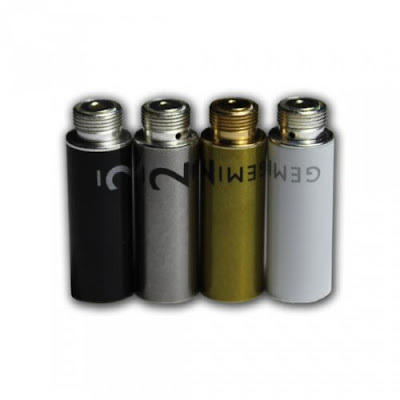 * 2.5″ length x 0.55″ diameter – including drip tip. You should have the technical knowledge and aptitude so you can fully enjoy the ZEUS. In addition, we suggest users have possession of multimeter and the knowledge to properly use a meter. * A rebuildable coil/wick should be tested carefully with a meter prior to use. * Faulty wicks/coils can ruin electronic devices. * New coil/wick units must be tested and then used first on a PV that has short circuit protection. 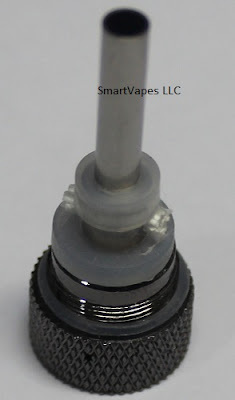 * Do not use with your new coil/wick assembly on your device until tested and verified to be safe. Here is a great deal on a transformer. For this price its a steal. Originally these were going for 80 bucks. The L-Rider Transformer is one of the best variable voltage vaping options you will find for such a reasonable price! With the L-Rider Transformer, you can check the voltage of your battery (it requires one battery of your choice –NOT INCLUDED) and can go between 3.0 to 6.0 volts for that specific taste you are going for! Each L-Rider Transformer has a fine chrome plated brass finish, is nicely weighted, and feels very solid in your hands. With the new L-rider Transformer you also have an Ohm Resistance check. This proves very handy when testing those new devices that you add on the fly. Testing the resistance on the new Lambo Transformer is easy. Pressing the fire button repeatedly five times will show the resistance, in Ohms, of the attached atomizer or cartomizer. Not having an atomizer or cartomizer attached will show an F1 error on the screen. 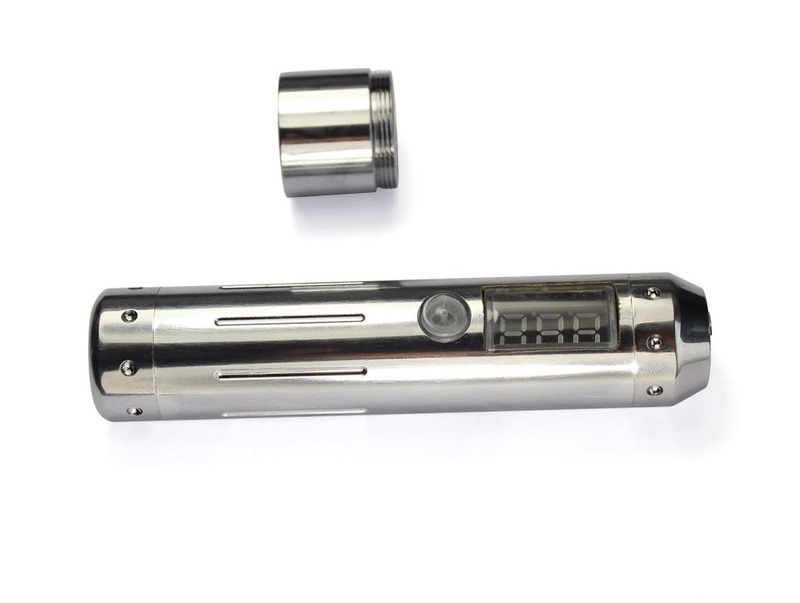 This is a great deal on Boge 801 fusion cartomizers. They come in both standard and low res. The Boge 801 Fusion cartomizers are one of the best cartomizers out there. Ivape just got their hands on about 50 of these. They are going to be selling them for $85.00 shipped. The apple on the top is the battery and the hoses contain the cartomizer. The Cartomizers are RN4081 style, but there are adapters for 510. These have amazing airflow and you can put liquid on the bottom for the bubbling effect. This is excellent for lounge style vape shops and the home vape lair.